Participating in the College Pass program gives students an affordable way to get to school and reduces parking demand. College Passes are valid for unlimited rides on all regional buses and trains. For fares above $3.25 (for example, select Northstar fares) stored value is required to cover the additional fare. A College Pass costs $165 per semester, and are valid for these terms. College Passes are not renewable, so administrators must place an order each term. Contact us to submit your order or if you have any questions. A valid student ID must be presented along with a College Pass when riding. The student ID allows Metro Transit Police to ensure that the pass is being used by a student and prevents fraudulent use. Participants must validate each ride by touching a College Pass to a card reader every time they board a bus or train. Without validation, the ride is not counted and Metro Transit Police cannot verify that the pass is active and valid. Metro Transit reserves the right to deactivate the College Passes of users who do not comply with fare policy. The College Pass must be registered in order to receive a replacement pass during the semester for $5. If the pass is not registered, a new pass must be purchased for the full amount. We encourage all College Pass cardholders to register their pass. For details on how the pass works and how to take care of it, read the online User's Guide or see the guide included with the pass. Each participating school assigns an administrator to manage the College Pass account. Metro Transit has an online administrator site, which makes it easy to track current passes and students, temporarily suspend or cancel passes and issue replacements. At the beginning of the school year, the school administrator receives College Passes that are ready to be issued to students; they are already valid for unlimited rides on buses and light rail, so it is very important to track each pass on the administrator site. If you don't have access to the online administrator site, please contact us and we'll send you an e-mail invitation that includes your access information. If you need to cancel a student’s pass, promptly deactivate the card using the administrator site. First, check to see if the pass was registered. You can do this by signing in to the administrator site and visiting the "Register Pass(s)" page. Enter the student's name to check if the pass has been registered. If the person's name is not found, the pass has not been registered. Use the administrator site to deactivate the old pass and issue a replacement from the initial shipment. If you do not have any unsold pass inventory, contact us. A $5 fee will be charged for any replacement pass unless the pass is deemed defective (it has no apparent physical damage and cannot be read properly by validators). Defective passes must be returned to Metro Transit for verification. A credit will be issued to the school each month for the total number of deactivated passes that were replaced. The credit amount is the difference between the pass cost and the replacement fee (e.g. $165 less $5 replacement fee = $160 credit). Sell the student a new College Pass. If it is at the end of the semester and the student does not want to purchase a new pass, they can purchase a Go-To Card. Note: if the student has a defective pass, it does not have to be registered in order to request a $5 replacement. However, the defective pass must be returned to Metro Transit for verification. An administrator can temporarily suspend a student’s pass. There is no replacement fee for this process because a new pass is not issued. The school will be invoiced three times per year if it participates fall, spring and summer semesters. Prior to each semester, the administrator must request passes and will be billed accordingly. At the end of the semester, the school must return any unsold passes within 30 days for a credit. 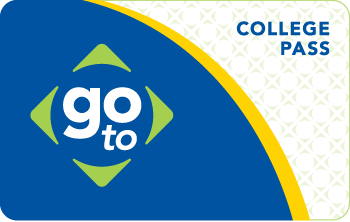 Display brochures and posters in high-traffic areas to promote the College Pass at your school and reduce parking demand. If you would like a customized brochures printed in a large quantity (over 1,000 copies) or a customized poster, please contact the outreach specialist in your area or contact Metro Transit to learn about options. "It's smarter than wasting valuable study time stuck in traffic." "It's smarter than adding to our already maxed out highways." "It's more affordable than spending big money on gas and car insurance."